There is a famous story involving the Greek mathematician/scientist Archimedes and whether a crown was solid gold. The king was trying to determine if a gold crown was pure or if the goldsmith had substituted cheaper silver in the construction of it. Archimedes has his “Eureka” moment when determining gold being denser metal displaces less water than silver thus allowing him to show the crown is not pure gold. Whether this story is true or not, it helps introduce the topic of specific gravity of objects. 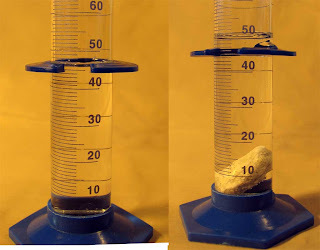 The measurement of the specific gravity is useful in helping identify minerals. Specific gravity is the ratio of density of material to the density of water. An easier way to think of it might consider two equal size containers. One holds water and the other contains a mineral like galena (lead). If one weighs both, the galena would be approximately 7 times heavier than the water. Use the table below to see some characteristics of common minerals found in Kentucky and Indiana. 1. 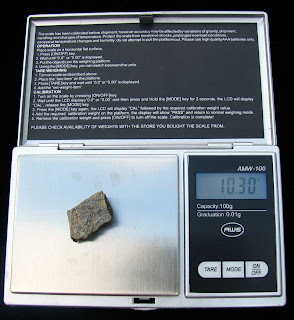 Weigh the mineral on the digital scale. Note the weight in grams. 2. Pour water in 100 mL graduated cylinder to a mL mark. 3. Place mineral specimen in cylinder and read the mark where the water has risen to. 4. Drain the water and mineral into the tub. 5. Subtract the water mark value with the starting water mark value. 6. Take that value and divide it in to the mineral’s weight. 7. 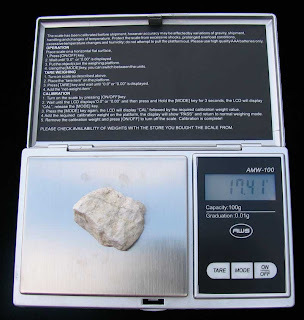 The value is the specific gravity of the mineral. 8. Use the specific gravity and appearance to study the table to find the closest match to a mineral name. 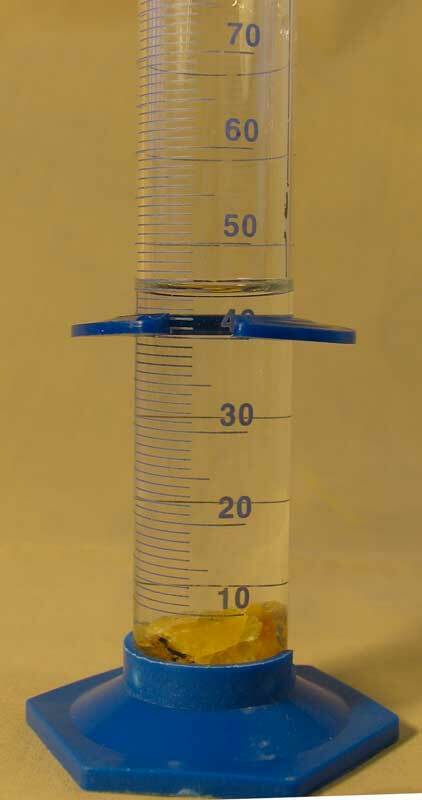 Water is placed in graduated cylinder and measures 56.1 mL. 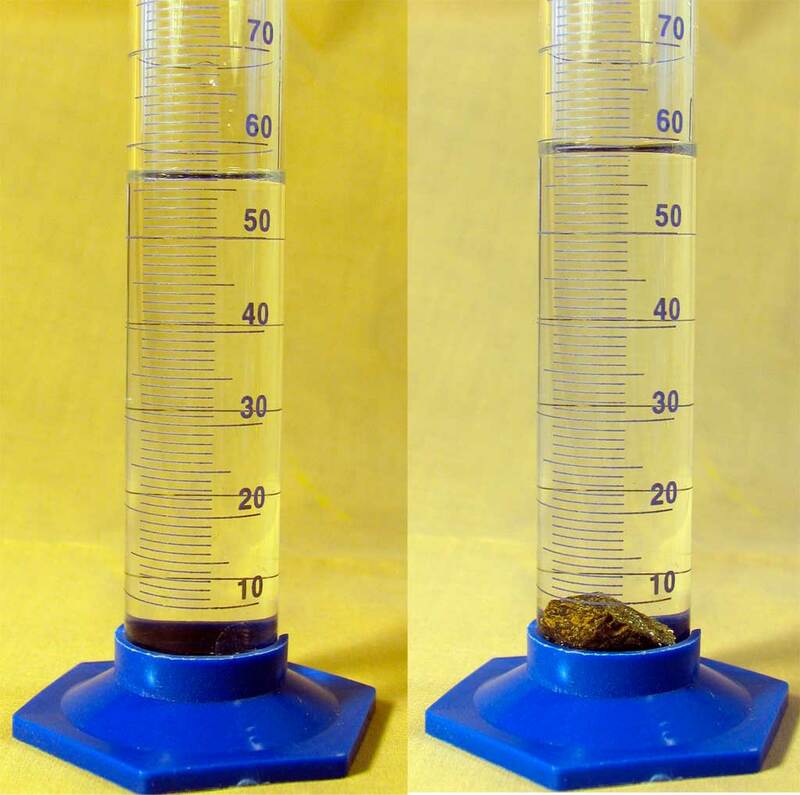 A specimen is placed in cylinder and water level rises to 58.5 mL. The difference is 2.4 mL. 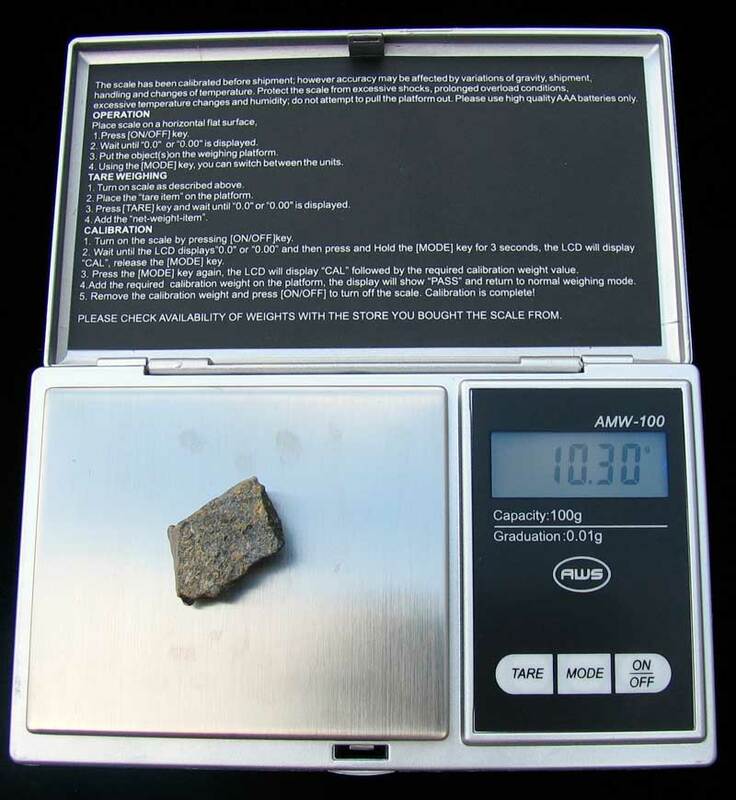 The specimen weighs in at 10.3 g. So 10.3 / 2.4 = 4.29. Since specimen is black it matches the mineral a sphalerite (3.9-4.2). 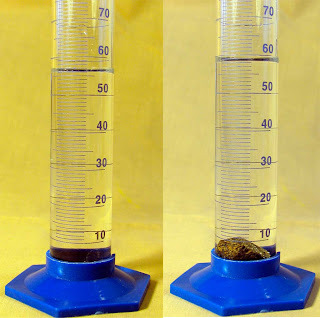 Water in graduated cylinder measured 46.5 mL and with specimen water raises to 50.5 mL. The difference in water level is 4.0 mL. The weight of the specimen is 17.41 g. Using the displacement from the earlier value 17.41 / 4.0 = 4.35. 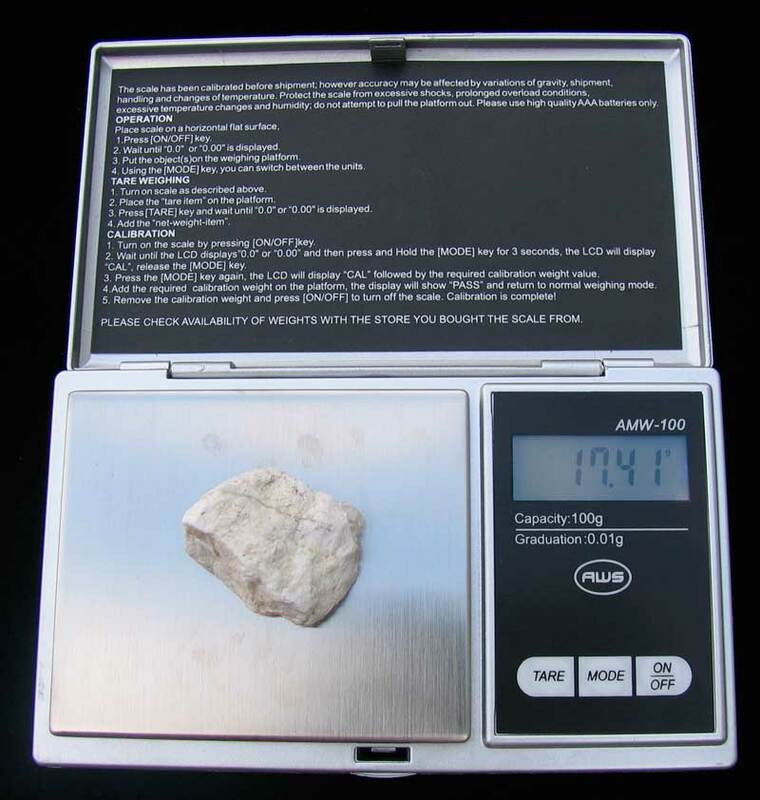 The specimen is white and fits in the 4.3-5.0 which matches barite.